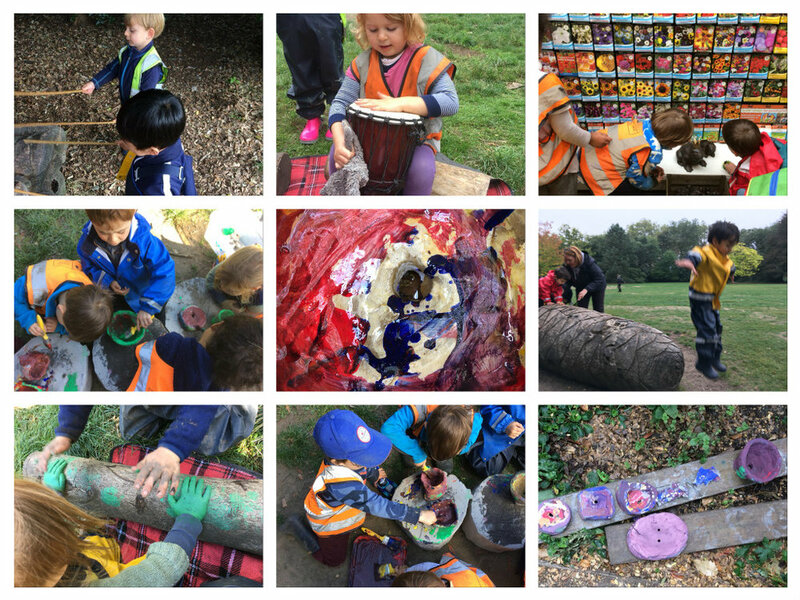 The forest has been filled with music, colours and creativity this week with the children experimenting further with natural materials and continuing with their projects involving clay and wood. It has been fascinating to observe how imaginative, inventive and reflective they have become when revisiting ideas that they have been developing over the course of days, or even weeks. Music is always popular with the children so what better way to keep all those hands warm during the recent chilly mornings than beating drums, playing glockenspiels and shaking tambourines, and although this may sound like all the ingredients for a migraine the reality is quite the opposite. After some initial experimenting and negotiation around the various instruments the children naturally start to collaborate together, listening to the different sounds, sharing ideas and occasionally developing rhythms that somehow work well together. Some of our older children have been asking to use tools more often in the forest so this week we introduced our newest children to a couple of new tools – the billhook and mallet. We have now formed an important routine where during our morning circle time, the children are shown the tools they will be using later in the day. They get to see a demonstration of how it will be used, along with discussing what things could be made with it and the rules we have when using tools; as always, the children were captivated! Throughout the morning children then took turns to split some small logs into a variety of shapes, allowing us to discuss how a circle becomes two semi-circles and then predicting what shapes we would be creating when splitting the wood further. The children then transformed these shaped pieces of wood into printing blocks, construction blocks, food for the mud kitchen and puzzle pieces by trying to reform the original log. The clay vessels they have been making were finally dry this week so it was time to treat them to a colourful coating of paint in preparation for their planting, they experimented with mixing various colours and discussed the effects and patterns that they could create with different brushes, and the results were absolutely beautiful. Our Jaybirds children also made a visit to the local garden centre where they decided upon a variety of seeds to buy, and they are all very excited about being able to plant them next week.